* Severt Leland - head, male, white, age 30, first marriage, 7 years married, born in wisconsin, father born in Norway, mother born in Norway, naturalized, speaks English, a Retail merchant, works in Groceries, can read and write, lives in a house. * Amelia Leland - wife, female, white, age 24, first marriage, married 7 years, 3 children born, 3 living, born Idaho, father born West Virginia, mother born Missouri, speaks English, no occupation, can read and write. * Juanita Leland - daughter, female, white, age 5, single, born Montana, father born Wisconsin, mother born Idaho. * Evelyn Leland - daughter, female, white, age 4, single, born Montana, father born Wisconsin, mother born Idaho. * Yudon Leland - son, male, born Montana, father born Wisconsin, mother born Idaho. 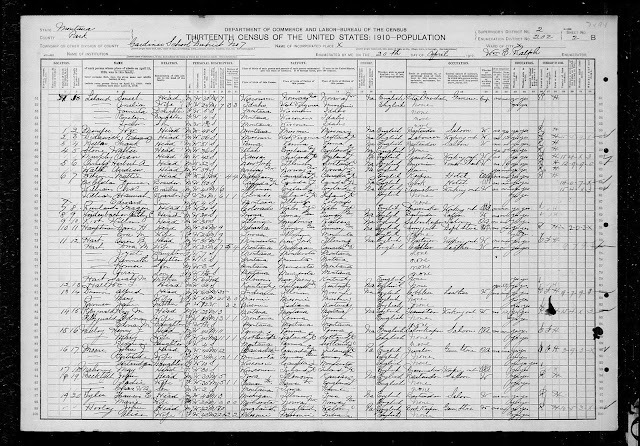 1910 United States Federal Census, Park County, Montana, population schedule, Gardiner township, Enumeration District 202, Page 2B, Dwelling #1, Family #1, Severt Leland household, digital image, Ancestry.com (http://www.ancestry.com), citing National Archives Microfilm Publication T624, Roll 834). Severt Leland and Amelia Brocke married 12 February 1904 in Helena, Lewis and Clark County, Montana. 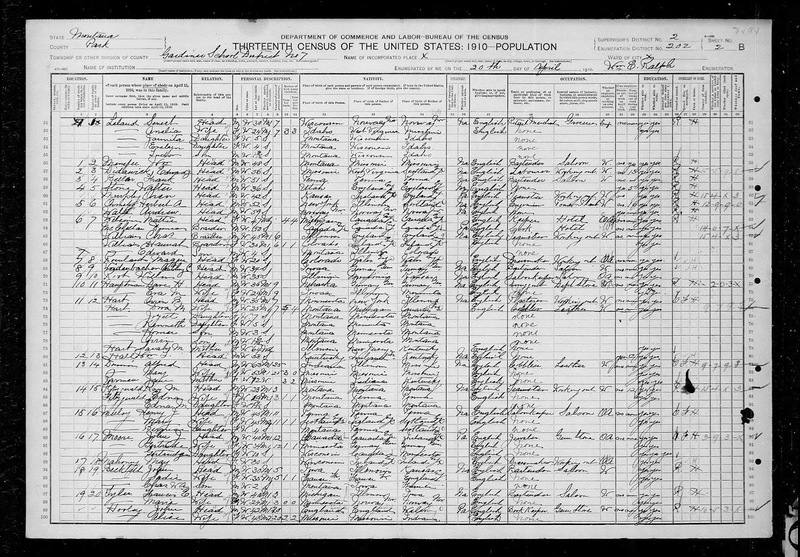 The three children listed in the 1910 census were all born in Montana, according to this record. The one year old son, indexed as Yudon Leland, is certainly Harold Arthur Leland (1908-1996). I don't see Harold or Arthur as a name in the census record - I see perhaps Luther. The enumerator may have misunderstood the name. Severt Leland (1878-1940) is my wife's paternal grandfather, through his second Leo Severt Leland (1911-2002).